Every five years EU citizens choose who represents them in the European Parliament. This year between May 23 to 26, people will again get to vote for a new European Parliament. Countries in the EU may decide on the exact election day within a four-day span, from Thursday to Sunday. The number of MEPs ranges from six for Malta, Luxembourg, Cyprus and Estonia to 96 for Germany. 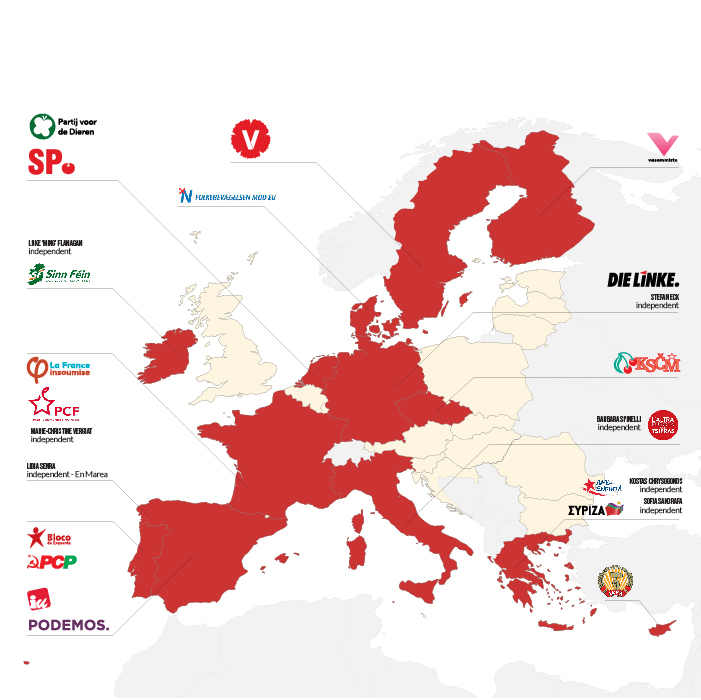 Elections are contested by national political parties but once MEPs are elected, most opt to become part of transnational political groups. In plenary sessions, committee meetings, parliamentary delegations and trilogue negotiations with the other EU institutions, our MEPs are a voice for those who are often excluded from debate in such circles. Austerity, privatisation and deregulatory policies in favour of big businesses are devastating for workers. Our challenge to prevailing EU economic doctrine and growing inequality involves coordination across several policy areas from demanding better employment and social rights to highlighting the devastating impact of tax dodging. The economy must serve the people and we have to ensure fair distribution of wealth throughout societies, countries and regions. Time is running out for strong measures to save the planet and deal with the massive challenge of climate change. The fight for sustainable and just environmental, agriculture and fisheries policies means protecting nature, standing up for small rural and coastal communities and pushing for strict controls on toxic chemicals. As part of this wider battle, we are parliament’s most steadfast champions of animal rights and welfare. Working towards equality and tackling deep-seated sexism in Europe means ensuring all EU policymaking is rooted in a gender perspective. Crucial to this are issues such as defence of women and minorities from attacks by the far right, the fight for equal pay, securing fundamental freedoms for LGBTQ people, and pressing the need for a real strategy to end violence against women and girls. Dignity, equality, and solidarity are the core principles we represent when it comes to questions of civil liberties and human rights in Europe and beyond. The EU cannot ignore the plight of those seeking a better life by building a fortress, nor ignore the rise of dangerous racist and xenophobic rhetoric. Alongside this work, we defend the need for citizens to access information by protecting whistleblowers and making sure big technology companies cannot abuse our data. Whether it is working for fair policies towards developing countries or maintaining pressure on the EU over human rights abuses against Palestinians or other oppressed groups, we are relentless in our pursuit of a Europe that forges positive relations with the rest of the world. We have been instrumental in highlighting the dangers of current trade policy, an affront to democracy that only serves the interests of multinational corporations. Foreign and security strategy must be based on peace, as opposed to the current trend towards militarisation. The backbone of our job is to hold the EU institutions and governments to account. From demanding transparency, to scrutinising budget proposals, to defending rights, peace and stability in the ongoing Brexit talks, our MEPs are a voice for accountability and integrity. In the continuing debate about the future direction of the European Union, we put forward alternative visions and challenge dominant neoliberal dogma.